EPL Suppliers of Hire plant to the building and construction industry. Locally owned, we carry an extensive range of plant from powered hand tools right up to large Earth moving machinery. Family business Equipment Planthire Ltd, with depots in Ballygawley, Co Tyrone and Mallusk, Belfast established in 1993 extends hire capabilities quite literally province-wide with it’s depot in Enniskillen. It’s easy to see why hirers use EPL wherever the contract. 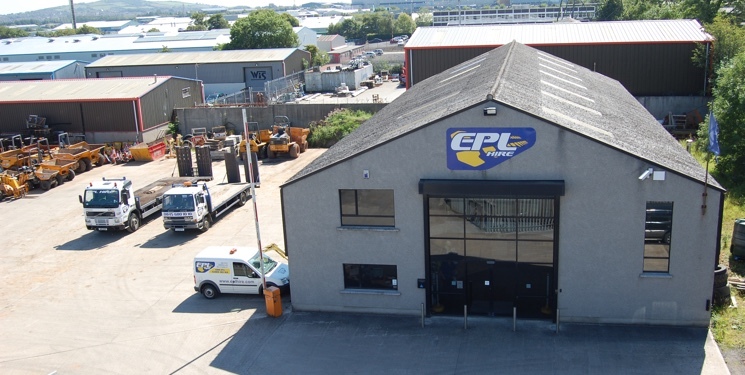 EPL’s Enniskillen depot, open since 2002 has expanded upon J. F. Andrews already impressive plant list with it’s specialising in Home, Garden and tool hire. Whilst EPL supplies one of the widest ranges of plant of any hire company, right up to the larger excavating and materials moving equipment, it is for the supply of ‘JCB Loadall’ tele-handlers and mini excavators that EPL has built an enviable reputation. Our recent logo change from the to a new blue and yellow, within a catchy shaped insignia is the first change from our old and original blue and silver company colours. Watch out for our new logo on our Depot, vehicles and on our plant on a site near you! EPLhire, your LOCAL hire depot. Why not try us today for our friendly personal service!